The fermented tea called kombucha is not a new concoction, but is gaining popularity with people who care about their health. You can find it in just about any health food store, plus many drug stores and supermarkets are starting to carry it. It is also very easy to make at home. 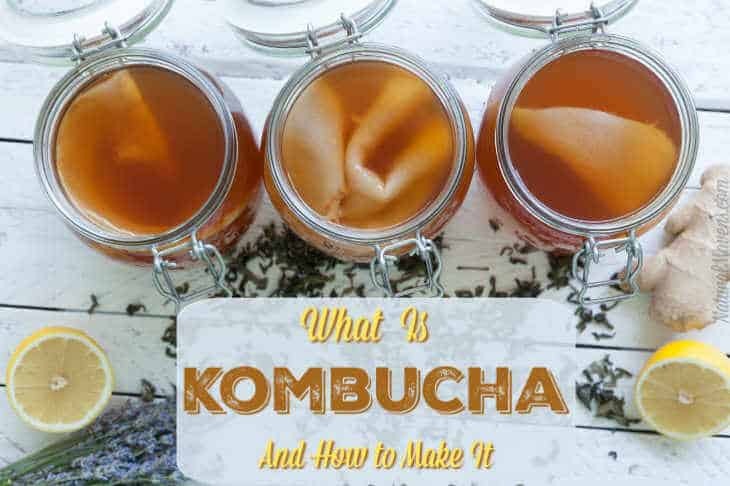 There’s a lot to like about this drink and here we’ll take a closer look – what is kombucha, why it’s good for you and how to make it. Kombucha is a type of probiotic drink, that closely resembles a tea. Probiotics are friendly bacteria similar to those naturally occurring in your body. They help keep your gut and digestive system healthy. It is possible to create kombucha with many different flavors. But, it all begins with the same ingredients – a starter with bacteria and yeast (or SCOBY), tea, and sugar. During a roughly 1 week fermentation process the ingredients transform into a sparkling, vinegar tasting tea. You can make kombucha at home from scratch (grab your SCOBY here) or begin with a kombucha starter kit. And if you want to try some kombucha before making it, there are plenty of ready made choices available (like these). Kombucha is available in many health food stores and some supermarkets. But like anything, it works out cheaper if you make it yourself. If you suffer from food allergies, having more natural probiotics can help with that as well. While there are supplement probiotics, a more natural option like kombucha is preferable to many. If you become a fan of kombucha, it is easy to prepare at home. It definitely works out cheaper and you can flavor it to your own taste. One thing to note is there is no need to worry about the sugar or caffeine. These get used up during the fermentation process. To make kombucha, you will need an active starter culture or SCOBY. You can buy these alone or as part of a kit. Another option is to ask around as many people who are regular kombucha makers will have an extra SCOBY on hand. When you’ve made kombucha for the first time, you will have your own for the next batch. Once you have your starter, combine it with sweetened black or green tea in a wide mouth jar and let the mixture sit for up to one week or until it is cloudy. You then remove the culture that forms on top and save it for future kombucha batches. The rest of the liquid is ready to drink or you can do a second fermentation. The second fermentation will give a sparkly, fizzy drink and this is also a chance to add flavor. Check out the video below to see how to make kombucha. When you make kombucha at home, it will be in its purest form with little sweetness remaining. Since green or black tea is typically used, it can be a very strong and pungent flavor. If you are not a fan of this type of taste, you may want to add in some flavor. You can use anything that would normally be added to flavor tea. Here are some different ways to flavor your kombucha tea. There are many great ways to flavor your kombucha so have fun experimenting. Kombucha is a drink that has a lot going for it when it comes to health . Whether you make it at home or buy ready made varieties, it is a great replacement for fizzy soft drinks. Give it a try – your gut will thank you.